This Sunday wedding took place in Early November and all parts of the day took place at the Grand Hyatt Tampa Bay, a BEAUTIFUL venue with TONS of shot opportunities. Brigitte and Tony aced every part of the day as you can see below. Plus we were so fortunate that they hired My Event Design to coordinate the ins and outs of their special day–hats off to you gals, especially Jennifer Grumpert who took the reigns on this one, it all came off perfectly! Simply love all of the straight lines, the metropolitan feel that this hotel has while still keeping a class and a variety of shot locations. Beautiful space. Brigitte’s Jimmy Choos were perfect. Their beautiful florals were designed in-house as well by the amazing My Event Design team. And a gorgeous Vera Wang wedding band. Wow. The girls looked fantastic in their pink bridesmaid dresses. And what a BEAUTIFUL gown, Brigitte! The ceremony was on the rooftop of the hotel, outside of Armani’s restaurant, where the cocktails and reception were held. The time of day was perfect and there was perfect lighting for both the ceremony and also the post-ceremony wedding party photos. Jason snapped this beautiful image through the restaurant window inside. 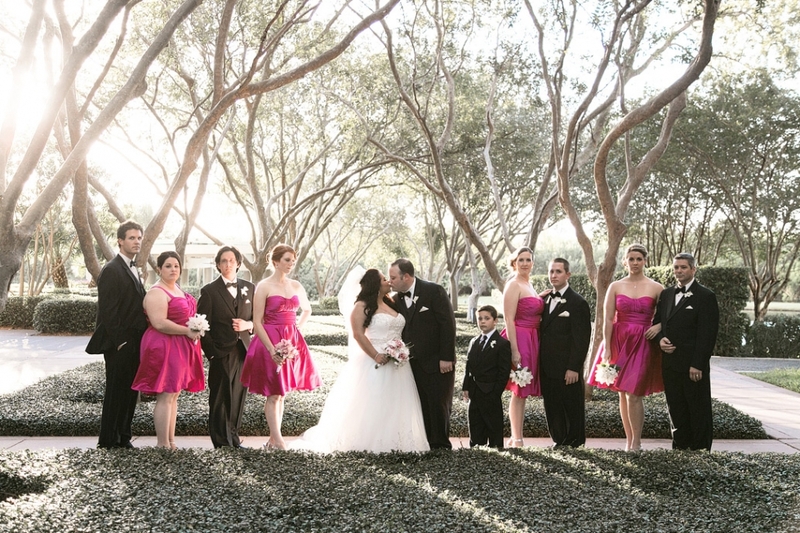 LOVE these shots and how they accent the architecture at the Grand Hyatt! Their simple decor tied together her Asian roots and still kept with the modern feel of the restaurant, making use of elegant whites and simple, straight lines. And a streamer exit to round out the evening. Loved it!